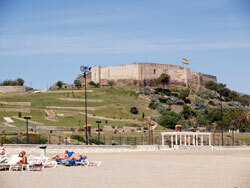 The beautiful scenery and the mild climate make Malaga an ideal destination for holiday and rest throughout the year. Besides this, you can enjoy great gastronomy, shopping, entertainment, fun, art, history and monuments in this southernmost part of Europe, which has far more to offer than sun and beach, the main attractive for thousands of tourists. Things to do in Malaga are several and plentiful around the city, especially with our GPS and a vehicle from our holiday resort, we can head to the historic centre, including cuisine, arts and tourism as the most attractive features. Enjoy Mediterranean cuisine in Malaga. Seafood and fresh fish are certainly the “best-sellers” for locals and tourists alike. There is a large offer on very good Restaurants; yet it is a special feel to have a freshly grilled fish in one of the many popular beach bars, directly on the beach just a few meters from the sea, with a slight breeze and the scent of grilled sardines over wood fire and a cold beer in hand! Quality of life doesn´t have to be necessarily expensive! If you know Pablo Picasso, you’re probably an art lover. This world-renowned artist was born in Malaga and even has a museum that bears his name to display his numerous art works. There are many places to visit and enjoy in Malaga. You can visit the many churches that show the beauty of religious architecture. The Cathedral of Incarnation, the Episcopal Palace and the Church of Santiago are some of these places, all situated in the charming historic centre. Regarding history and monuments, you can visit the impressive Gibralfaro Moorish castles. You will feel the real life of the south, culture and heritage as you walk down the bustling streets and enjoy a coffee in one of the many terraces. Join the locals for a stroll in the Alameda Park or the sea promenade at dawn. There are so many places to enjoy. You will even feel like part of the population, as you begin to feel the aura and this wonderful and unique way of life in Malaga. Come to the south, relax and enjoy! Why not hiring also a GPS with your rental car in Malaga?, we provide GPS to all customers who request it for a little extra fee. Start planning your visit to Malaga!